WASHINGTON – Just days after President Donald Trump threatened to shut down the government if Congress does not act on immigration reform, the Senate joined the House last week for their August recess. After a year of squabbling on immigration reform, and despite the nudge from the president, experts say it’s increasingly unlikely that anything will get done by this Congress. Just like the last several Congresses. It’s not a new fight. One of the first things Sen. Jeff Flake, R-Arizona, did when taking office in 2013 was join the bipartisan Gang of Eight – four Democrats and four Republicans, including fellow Arizona Republican Sen. John McCain. They crafted a sweeping immigration reform bill that passed the Senate before stalling in the House. Repeated efforts to move a bill – any bill – have failed. Flake, who is not running for re-election, is likely to leave office at the end of this year with no progress on comprehensive immigration reform. Nothing will happen for at least the next nine days, the length of the Senate’s recess. House members are not scheduled to return until September. The immigration wars started heating up last year, with the election of Donald Trump after a campaign of harsh rhetoric, including his promise to build a border wall. 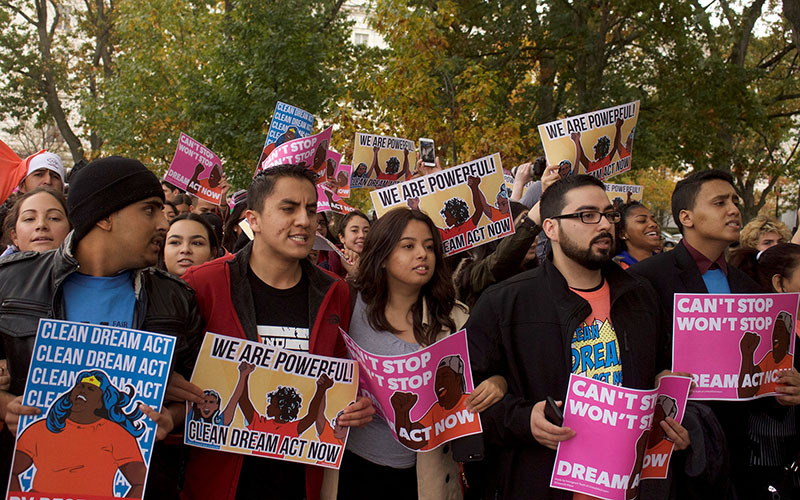 Last September, Trump announced plans to phase out DACA, the Deferred Action for Childhood Arrivals program. The Obama-era program protected as many as 800,000 young immigrants who were brought to this country illegally as children, deferring their possible deportation and allowing them to get work permits, driver’s licenses and more. Lawmakers from both sides of the aisle, in both chambers, have introduced bills that would do everything from protecting DACA recipients to reducing legal immigration numbers. But House efforts to pass any reform have been stalled by fighting between Democrats and different wings of the GOP. Faced with a threat from Democrats and some Republican moderates that would have forced votes on four different bipartisan bills, House Speaker Paul Ryan instead brought two GOP-backed bills up for a vote. Both failed. One that had protections for DACA recipients was too conservative for Democrats, yet too lenient on undocumented immigrants for more conservative Republicans, while the more-conservative alternative was too far to the right for some moderate Republicans. “It’s a big challenge for Republican leaders in both chambers to figure out how to deal with those different camps within their party,” said Molly Reynolds, a fellow in governance studies at the Brookings Institution. Rep. Raul Grijalva, D-Tucson, said comprehensive immigration reform that addresses border security, family reunification and a permanent solution for DACA recipients is necessary, but unlikely, particularly with the conservative Freedom Caucus pressuring Ryan. Nowrasteh agrees that conservatives have been able to move the debate farther to the right, noting the “dramatic” cuts to legal immigration that were included in the latest pair of failed bills. But Rep. Debbie Lesko, R-Peoria, said Democrats have their fair share of blame in the failure of the two immigration bills that came to the floor last month. Lesko supported the more conservative of the two bills – which still would have included some protections for DACA recipients – but voted against the so-called “compromise bill” that would have given citizenship to DACA recipients and their parents. “They (Democrats) didn’t vote for that one either, which makes me wonder if they really want to solve the problem or not,” Lesko said. Lesko and Grijalva agree on one thing – immigration will be an issue in this fall’s elections. But Grijalva said it is the Republicans who are using it as political fodder. He said that if control of the House were to flip, immigration reform could pass. “Hopefully after the midterms, with a different majority, we can get about the business of getting some legislation and trying to solve the problem,” he said. Until then, Reynolds said, expect more of the same. “I don’t see it being terribly likely that we get a big immigration package between now and the election, or even in the short term after the election,” she said.